These files require the FREE Adobe Reader to save, view, or print. DEFACING PAVEMENTS OR CURBSTONES. PLACING DAMAGING SUBSTANCES ON PAVEMENTS. SIDEWALKS TO BE KEPT CLEAN BY ABUTTING OWNER. OBSTRUCTING GUTTERS OR DITCHES. PROHIBITED GENERALLY. VACANT BUILDINGS, OPEN WELLS OR EXCAVATIONS. HAZARDOUS CONTAINERS. PREMISES TO BE KEPT FREE OF GARBAGE, INOPERABLE VEHICLES, TIRES. NOTICES OF VIOLATIONS. STORAGE, DISPOSAL, ETC., OF RUBBISH, GARBAGE. COMMERCIAL OR INDUSTRIAL PROPERTY; KEEPING IN SANITARY, CONDTION; DUTY OF ONWNER AND OCCUPANT. STORAGE, DISPOSITION OF RUBBISH, GARBAGE, ETC. CONDITIONS PROHIBITED ON PREMISES. VIOLATION A PUBLIC NUISANCE. ENFORCEMENT RESPONCIBILITY. CONTENTS OF ABATEMENT NOTICE. SERVICE AND POSTING OF ABATEMENT NOTICE. APPEAL TO COUNCIL. TOWN ABATEMENT OF UNLAWFUL CONDITIONS. NOTICE OF ASSESSMENTS. CONTENTS OF ASSESSMENT NOTICE. HEARING ON ASSESSMENT. FILING OF ASSESSMENT. TOWN SUIT FOR AMOUNT OF ASSESSMENT. RIGHT OF ENTRY. SEVERANCE PROVISION. AN ORDINANCE CREATING A COMMERCIAL FACADE IMPROVEMENT PROGRAM WITHIN THE CITY OF GOOD HOPE, ALABAMA. AN ORDINANCE PROVIDING FOR THE ESTABLISHMENT OF DISTRICT WITHIN THE CORPORATE LIMITS OF THE CITY OF GOOD HOPE, ALABAMA: REGULATING WITHIN SUCH DISTRICTS, THE HEIGHT, SIZE OF YARDS AND OTHER OPEN SPACES, THE DENSITY OF POPULATION, THE USE OF BUILDINGS, STRUCTURES, SIGNS, AND LAND. THE INTENT OF THIS ORDINANCE IS TO: (A) PROMOTE THE GENERAL WELFARE AND SAFETY OF THE COMMUNITY. (B) REQUIRE A BUILDING PERMIT FOR ALL INCORPORATED AREAS OF THE CITY OF GOOD HOPE (PERMIT MUST BE OBTAINED PRIOR TO START OF PROJECT). AN ORDINANCE TO AMEND THE ZONING ORDINANCE OF THE CITY OF GOOD HOPE TO PROVIDE ADDITIONAL USES PERMITTED UPON APPEAL IN BUSINESS ZONE FOR TATTOOING, BRANDING AND BODY PIERCING. 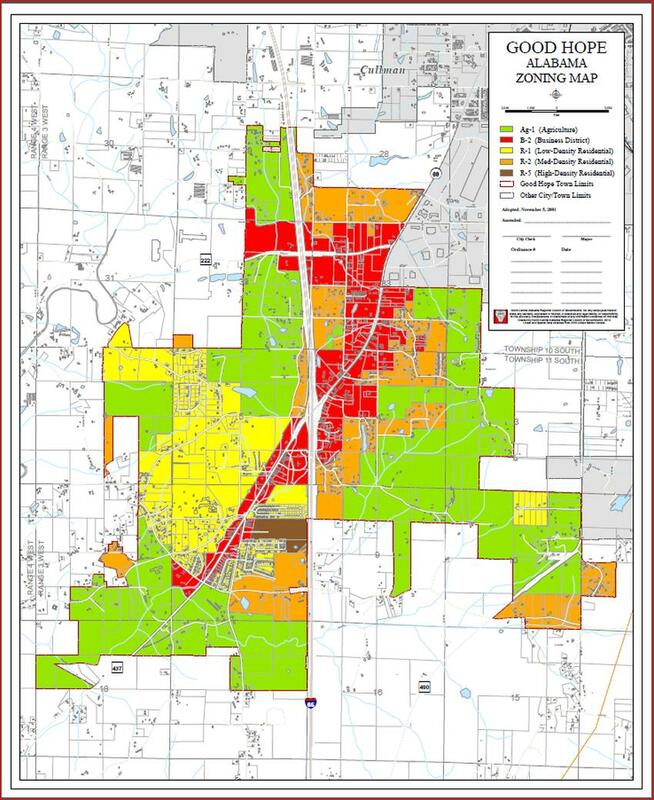 THESE ARE ADOPTED REGULATORY POLICIES OF THE CITY OF GOOD HOPE PLANNING COMMISSION PERTAINING TO THE CONSTRUCTION OF STREETS AND/OR DRAINAGE STRUCTURES (INCLUDING PIPE REQUIREMENTS) FOR NEW ROADS OR NEW SUBDIVISIONS AND/OR OTHER DEVELOPMENTS IN THE CITY OF GOOD HOPE, ALABAMA. The City Does Not Impose the Business License TAX in its Police Jurisdiction. AN ORDINANCE OF THE CITY, A PRIVILEGE OR LICENSE TAX, PARALLELING THE STATE TAX, UPON EVERY PERSON ENGAGING OR CONTINUING IN THE CITY IN THE BUSINESS OF RENTING OR FURNISHING ANY ROOM OR ROOMS, LODGING, OR ACCOMMODATIONS TO TRANSIENTS IN ANY HOTEL, MOTEL, INN, TOURIST CAMP, TOURIST CABIN, OR ANY OTHER PLACE IN WHICH ROOMS, LODGINGS, OR ACCOMMODATIONS ARE REGULARLY FURNISHED TO TRANSIENTS FOR A CONSIDERATION. AN ORDINANCE REGULATING THE SALE AND DISTRIBUTION OF ALCOHOLIC BEVERAGES WITHIN THE CITY OF GOOD HOPE, ALABAMA, PROVIDING LICENSING PROCEDURES AND ESTABLISHING PUNISHMENT FOR VIOLATIONS.